Saturday was a very busy day for me. I went to the gym and did the water aerobics class. 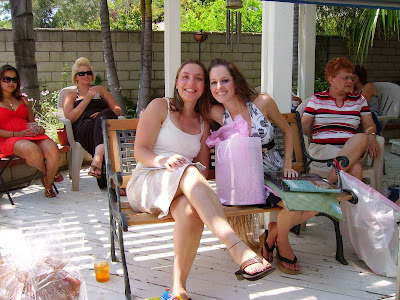 After that I drove to Diamond Bar to attend Erica Perrin's bridal shower. I saw some people I hadn't seen in quite a while. Cathy and Kim were there. Erica's family put on a very nice event, and Erica got so many cool shower gifts. Kelly and Erica. Kelly was her assistant as she opened her gifts. 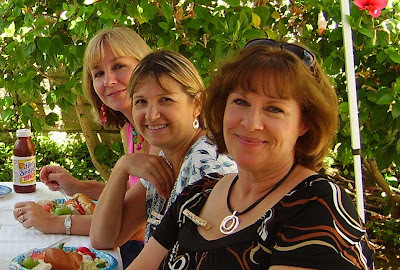 In the evening, Cathy and Tim, Ty and Kim, Rondi and Neil, and Carl and I went to the "Concert Under the Stars" fundraising event at the Hafif estate in La Verne. What a great night. It's a fundraiser for different groups, ours was for Habitat for Humanity. The Hafif Family puts on a wonderful evening with appetizers, dinner, drinks, live music and dancing, on a 150 acre estate. It's held in a huge grassy park-like area with beautifully lit trees and landscaping. Everyone there had a wonderful time. Especially Cathy P. She always has the "best" time. Until someone stepped on her foot while she was line-dancing.... barefoot. Even Carl danced. Thanks Carl. Then on Sunday I went with Teresa to help her and Keith organize some of the family heirlooms in the Long family home. We really cleaned up and out. I'm very proud of the 3 of us. PS.... Here are a couple of blurry pictures of my final project for my computer graphics class. We created packaging for a toy. We first had to make a spin off of an existing toy, so I chose the Cars character, and made it a girls version named "Queenie". This was a good class, very challenging.